Patriots quarterback Tom Brady (12) has had to utilize other weapons like wide receiver Malcolm Mitchell (19) in the absence of tight end Rob Gronkowski. 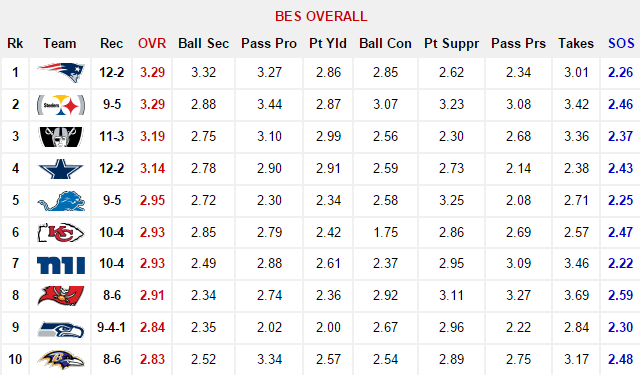 Week 15 turned out to be another accurate one in terms of our data predicting winners as the BES posted another 11-5 record based on our Week 14 report. That brings our win/loss tally to 55-22 (.714) over the last five weeks. 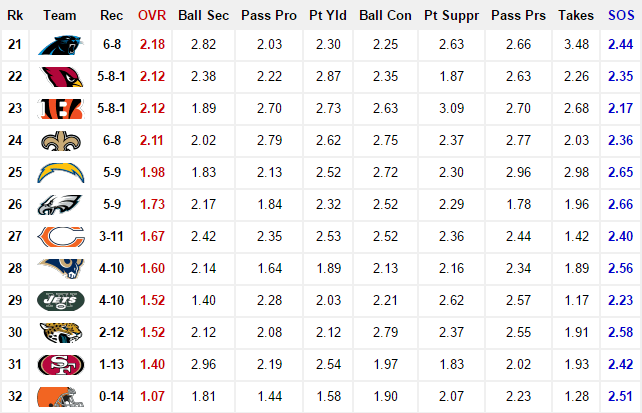 In terms of this week’s report, we have some probable postseason confrontations shaping up based on the BES Top-10. The Patriots (12-2) top our rankings for a second consecutive week and find themselves tied with the surging Steelers (9-5) in BES Overall with a score of 3.29. It’s not unfathomable for the two AFC powerhouses to do battle in January. Patriots quarterback Tom Brady has kept their offensive train on track despite the loss of tight end Rob Gronkowski. Rookie wide receiver Malcolm Mitchell has aided Brady by emerging as a viable weapon in the passing game, amassing 277 yards and four touchdowns on 22 receptions in his last five games. Over that same span the Patriots have owned the No. 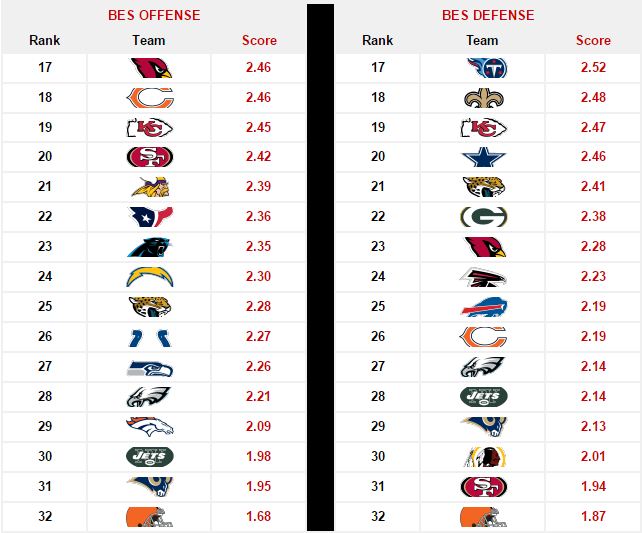 1 spot in BES Offense. 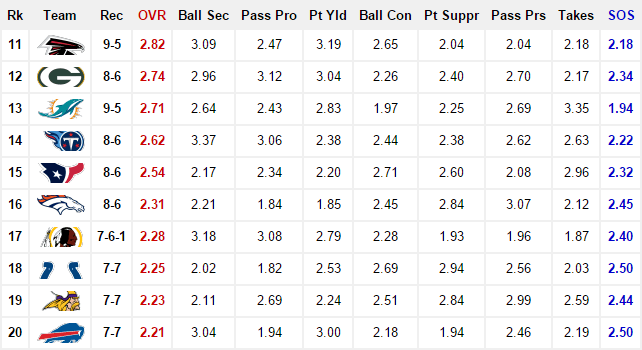 Meanwhile, the Steelers (9-5) continue their assault on our rankings, landing at No. 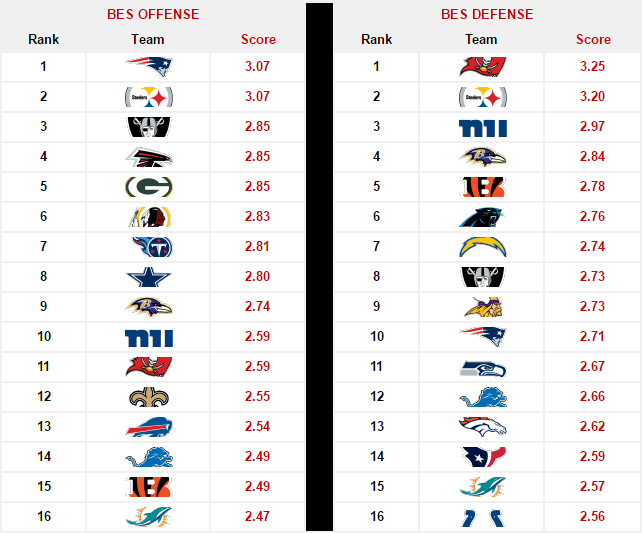 2 across the board in BES Overall, BES Offense and BES Defense. They close the season with two home games against the Ravens (8-6) and the Browns (0-14). Their clash with the Ravens is arguably Week 15’s marquee match-up with the AFC North title at stake. The Packers (8-6) have made a notable leap from No. 18 in our Week 14 report to No. 12 this week with a +.38 increase in their BES Overall score. Winners of their last four games, the Packers remain in the thick of the NFC playoff race and have the NFC North crown within reach. Their season culminates with a visit to the Lions (9-5) in a probable showdown for the divisional title. 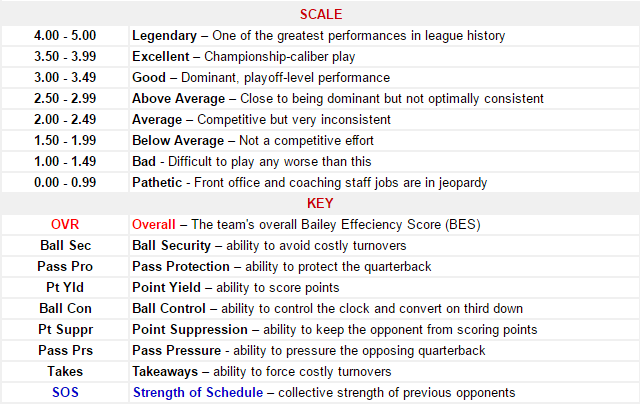 I made some tweaks to the system this offseason.